ENERGY STAR - North Star Windows | Find a Dealer Today! The international ENERGY STAR® symbol is a simple way for consumers to identify products that are among the most energy efficient on the market. Only manufacturers and retailers whose products meet the ENERGY STAR® criteria can label their products with this symbol. Choosing an ENERGY STAR® labeled product over a conventional model could save you hundreds of dollars in energy costs. 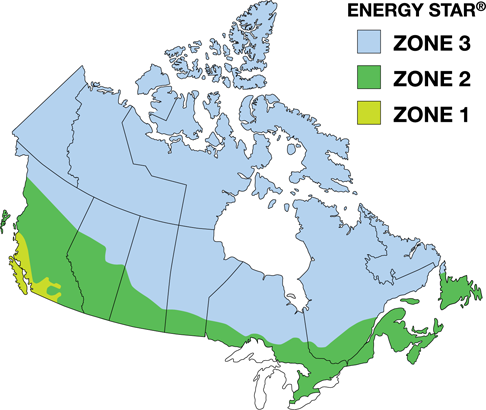 Because of the nature of Canada’s diverse climate, the country has been split into three zones to help you find the energy efficient products that best suit where you live. Zone 1 is the warmest climate, and Zone 3 is the coldest. Similarly, the United States has been split into four zones: Northern, North/Central, South/Central and Southern. Once you’ve determined the zone where you live, you can find the best ENERGY STAR-approved options available for your region. For greater energy saving, consider installing windows and doors suited for colder regions than your own. For more information on ENERGY STAR performance levels, visit the Canadian government’s Office of Energy Efficiency’s website. U.S. residents should refer to the official U.S. government ENERGY STAR website.